The annual Savannah Children’s Book Festival takes place in the middle of November every year in Forsyth Park and is truly a special event for readers of all ages. The festival showcases the power of the written word and celebrates the joy of reading, imagination, and storytelling for children. This charming event is beloved by Savannah residents and visitors alike, and as an added bonus, it’s completely free! So book your trip, grab the kids, and spend the day exploring the magic and wonder of literature in beautiful Savannah. To learn more about the Savannah Children’s Book Festival, and other fun attractions in the area, download our free Vacation Guide! It’s your ultimate guide for everything to do in Savannah during your stay at Presidents’ Quarters Inn. Award-winning children’s book authors and illustrators will participate in various activities throughout the day. Arts and crafts, costumed characters, vendor tents, and a variety of food and entertainment will be available for guests to enjoy at the festival. The Young Writers Contest is an open contest that takes submissions from area students! Children are asked to write a poem in any format, but they must include five words from some of the featured festival books. The poems will be reviewed by a panel of judges, and the winners in each age group will receive Barnes & Noble gift cards. There is a deadline for submissions, so get those creative juices flowing! To find out more information, visit the Young Writers Contest page. Renowned talents such as Atlanta based illustrator and artist R. Gregory Christie, Cuban refugee author Carmen Agra Deedy, and Savannah’s own Jose Lucio, who received the Best Local Author award in 2016. There will be many more authors, artists, and illustrators at the festival to sign books and converse with readers! Seeing their favorite storytellers in person will leave your children feeling both excited and inspired. In addition, New York Times bestselling author Kwame Alexander will be in attendance. He has written 24 books, founded two literary organizations, and travels the world as a literary advocate. He received the Newbery Medal in 2015 for his basketball novel, The Crossover. The Newbery Medal is given to the author of “the most distinguished contribution to American literature for children”. Alexander is also celebrated for his popular children’s books Solo (Blink) and Surf’s Up, both of which have recent success. The Savannah Children’s Book Festival is sure to attract a crowd, so book your trip now! 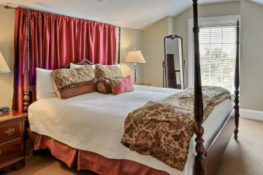 When searching for the perfect homestead, look no further than Presidents’ Quarters Inn. Just a short walk from Forsyth Park, our spacious Thomas Jefferson suite, with a lofted king bedroom and tons of room for the kids, is ideal for families traveling to the Savannah Children’s Book Festival. And since you’ll be in the area during our favorite time of year, check out our blog to learn about things to do in fall in Savannah GA.